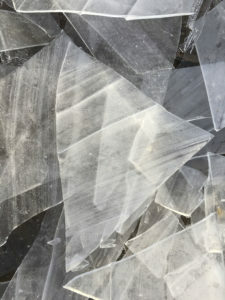 These photographs of ice were captured one cold spring morning in my neighbourhood. While out walking the dogs I noticed the morning sun lighting up the ice that had formed in my local park. The ice was beautifully transformed into landscapes, outer space, architecture, alien structures and so much more. The more I look, the more I see in each photograph. These images found me that freezing morning rather than the other way around. Writers often describe how words flow through them almost like the writer is the channel for a higher voice. I too find the light speaking to me in this way. Where my surroundings are illuminated in a way rarely seen. Or is it that my eyes are trained to see the beauty in everyday things? All that I really know is that the mundane is cast in a new magical light. And so I found myself in my local off-leash, dog park one February morning and the ice was glowing from within and the light slaked these incredible tiny ice formations turning them into the entire universe. I remember when Chaos Theory hit the mainstream and how my mind was blown by the repetition of shapes: a shoreline resembles a fern leaf, a seashell mimicked a cloud formation. My mind keeps wandering back to these ideas of repeating patterns as I study these ice images. I see the cosmos, a spine, a new star forming, angel’s wings. I see razor clams and an alien landscape reminiscent of Ridley Scott’s Alien. I see structure and architecture and form. Truly the universe can be found in these tiny ice formations. They say that the best camera to use is the one that you have with you. On that frosty morning, I had my I-phone 6. I even brought my trusty DSLR the next morning but the magic had gone. The angle of light different, the higher voice had moved on to sing elsewhere.